When we have a Buddy Bounce Open Jump, kids can bring a friend, school mate, neighbor or sibling and pay only $5 per bouncer. Must be buddied up for this special rate. Regular general admission rate applies for children without a buddy. Max of 3 Buddy offers per group, family or reservation(Max 3 offers). 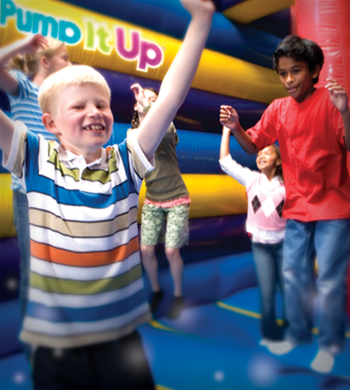 Check our event calendar for specific Buddy Bounce Open Jump Times. Buddy discount only applies during scheduled Buddy Bounce Events. Please Note: Frequent passes can be used for this open jump but buddies will be charged the regular general admission rate per child. First bouncer must be a paid bouncer for the discounted Buddy Bounce rate to apply. As always, socks and a signed waiver are required to play! Children must be at least 34" tall to play on inflatables. Our Sensory Jump times are open to families with children on the autism spectrum. This is a time to come and enjoy jumping, climbing, sliding, and playing with others in an understanding, lower sensory environment. We keep the music, microphone, and glow lights off and keep the attendance smaller than most jumps. We also try to have a quiet room available for those that might need a break. At this Open Jump, we'll run our bubble machine at least once an hour. Dance in them, play in them, pop as many as you can! 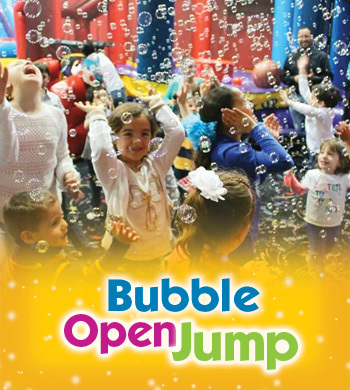 Kids of all ages will enjoy this bubble filled jump! 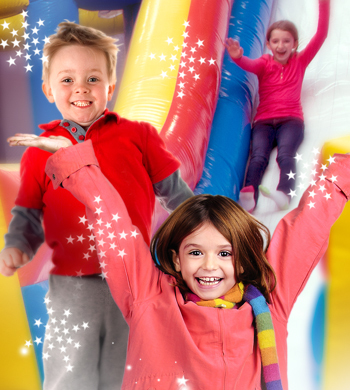 Come jump, slide, climb, and play on our giant inflatables and also enjoy the bubbles! Socks and waivers required for all participants. Children must be at least 34" tall to play on the inflatables. Parents/ Caregivers are free with paid child admission. Siblings under 34" are also admitted free with a paid sibling admission. Toddler toys are available for smaller siblings. Our Open Jumps are open play time on our giant inflatables! Kids can bounce, climb, slide, jump, and play. It’s not only fun for the kids but provides a healthy workout that burns off excess energy and helps keep them fit. It’s fun for kids of all ages*(see below). *Children must be at least 34" tall to play on inflatables. Parents/Caregivers are included in child's admission price, as are siblings under 34" tall. Socks and waivers are required for all participants. Yes, parents are allowed on our inflatables as long as they meet the height, weight, and other safety requirements. Certain events may have different requirements, so please click on the specific event you are interested in on our event calendar to find out details. When we have a Pumpjama Open Jump, wear your PJ's and get $2.00 off the general admission!!! Children must be at least 34" tall to play on inflatables. Socks and a signed waiver are required to jump. Parents/Caregivers are free. Pumpjama Open Jump is usually held on Mondays, but schedule is subject to change. Check out our event calendar for current schedule. Pumpjama discount will only apply during scheduled Pumpjama Events.